In home decor it's important to design towards your likes but it's also fun to add in some piece that are on-trend. Interior design trends change much slower than everyday fashion, so even though you may be picking something 'trendy' that doesn't mean it will go out of style quickly. And if you're choosing something you love, it will never go 'out of style' for you! Browse some of our favorite picks for mixed media furniture - combining two different materials can help tie together your favorite pieces, even if they don't lie in the same design category. 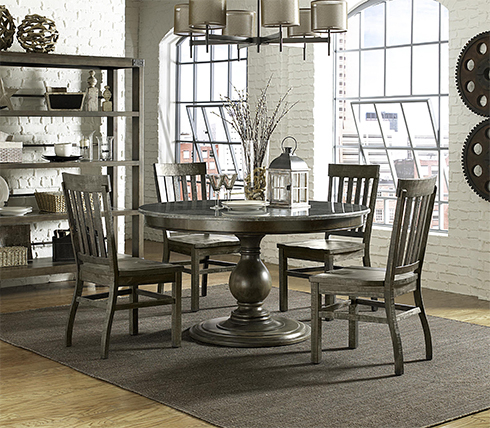 The Durham Collection offers two dining or kitchen table options with bluestone tops built upon dark iron bases. This sleek collection is a great look for your dining room or kitchen. The combination of materials on this collection provides a traditional appeal with an industrial influence! The dry grey acacia wood finish and a bluestone top on this pedestal table proves to be a winning combination. 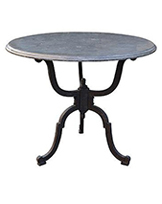 With a transitional look this mixed media table can fit in homes with traditional styling or industrial features. The Voyage Sideboard from the HGTV® HOME Furniture offers unique contemporary styling with a bluestone top. This is the ideal entertaining piece. Store all your serving dishes away during your day to day dining and pull them out for your next gathering. Spread your favorite dishes on top of the bluestone to create an ideal buffet. This sleek cocktail table features a beautiful piece of marble set atop a metal frame. Perfect for pairing, bunching, and coordinating with the perfect length sofa. Mixing wood tops and metal legs for dining tables brings your home a bit of a rustic influence as well as an industrial touch. 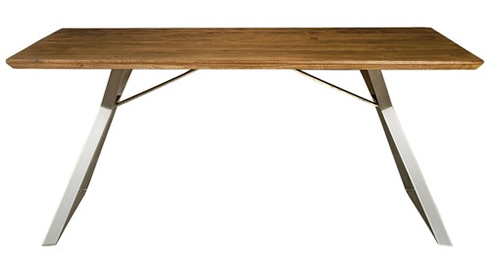 Or switch it up with a modern table that features a glass top and wood base! 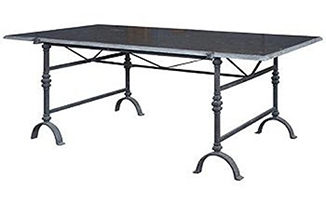 This unique trestle style base is the perfect geometric focal point for your room. For a sleek, modern look you can't go wrong with metal and glass! This combination is a great choice for occasional tables to add some surface space while keeping things 'light'. Minimalism can be just as eye-catching as a heavy, traditional dining table with the right choice of materials. Combine glass and metal for a sleek look that's perfect for smaller spaces and urban influenced condos or apartments. To see these and other mixed media pieces, come and tour the Belfort Furniture Showrooms in Dulles, Virginia. With over 100,000 Square Feet of Showroom Space, you're sure to find more than one thing that you love!